Installed dual-cam operated front brake. 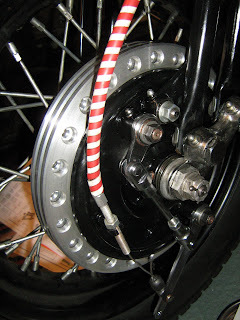 As I really felt there where need for improving my bob job`s front brake I found the dual cam front brake kit now availiable from several sources to be a god alternative. I purchased this from W&W. To stand out from the crowd I added a aluminium ring with cooling fins on the drum. Had to run the drum in the lathe to get its external round, heated the ring to 200degree celsius before I installed it to the drum. It is fitted with 0,5mm negative fit.